Quahogs (pronounced KO-hogs) are a variety of clam that can be found in abundance on the shores of New England. 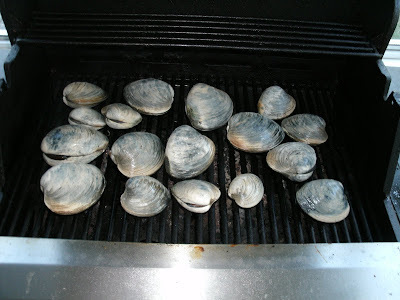 We have a clamming license and we pluck a few dozen quahogs whenever we're at the shore. 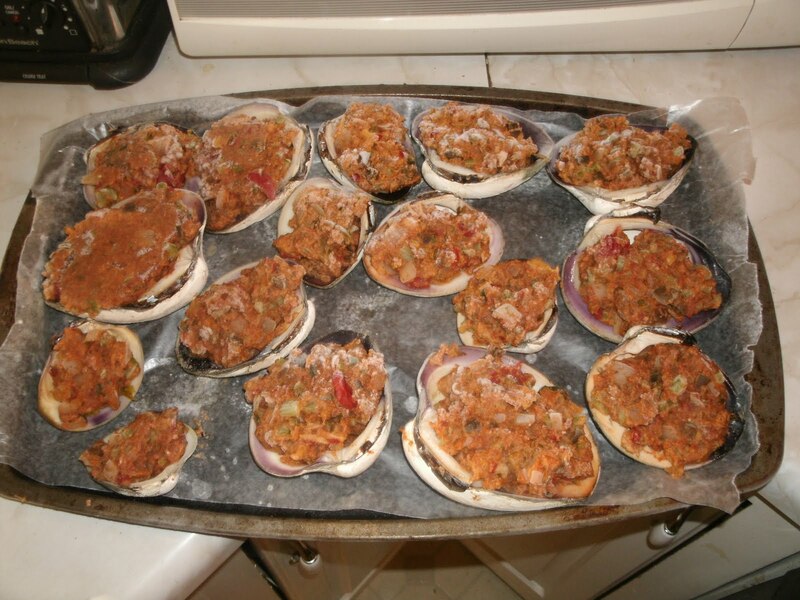 These aren't steaming clams, they're best eaten raw or in what we call "stuffies." 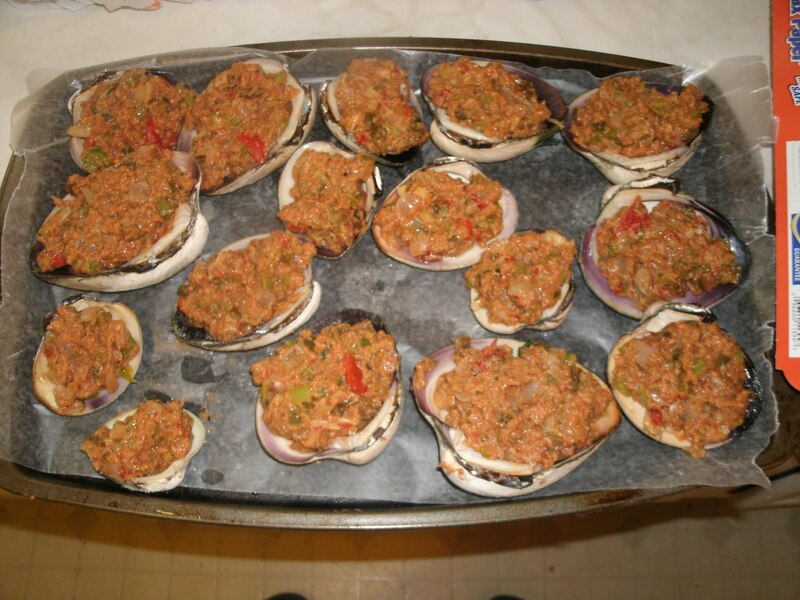 Smaller quahogs can be eaten raw, but the larger ones are better suited to making "stuffies" or stuffed quahogs. 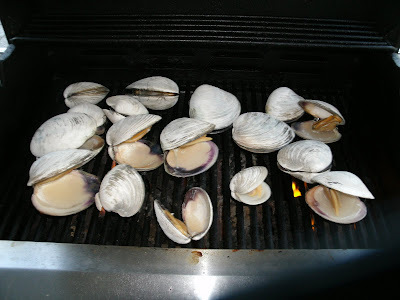 Rather than shuck the clams, I drop them on the grill on medium high heat until they open. I chop up a whole onion, a green or red pepper and a few stalks of celery. 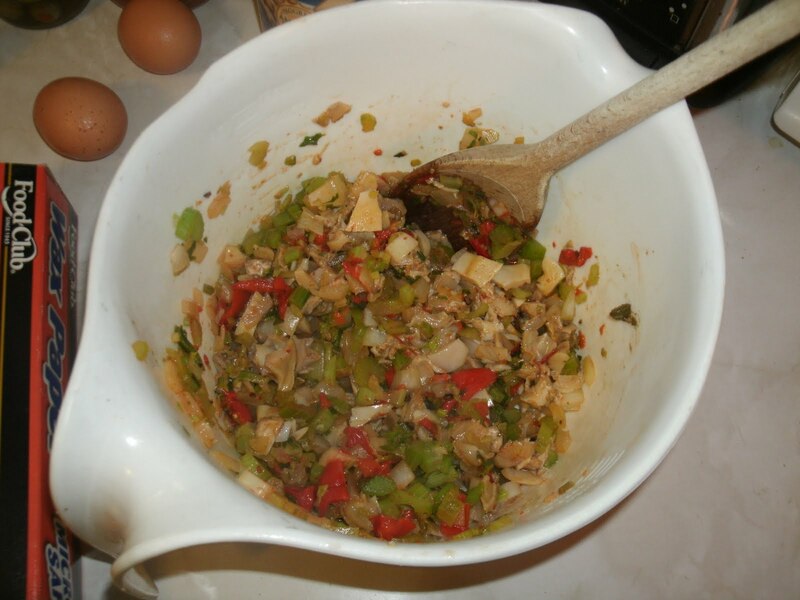 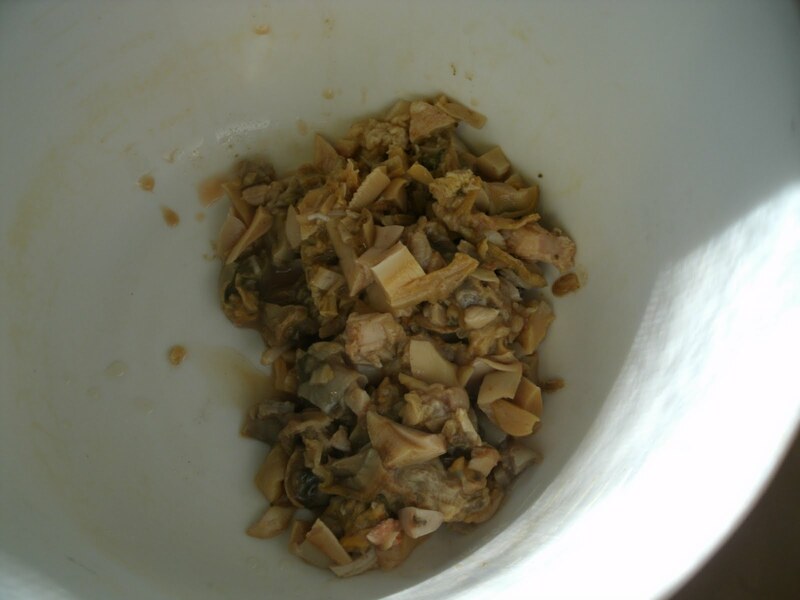 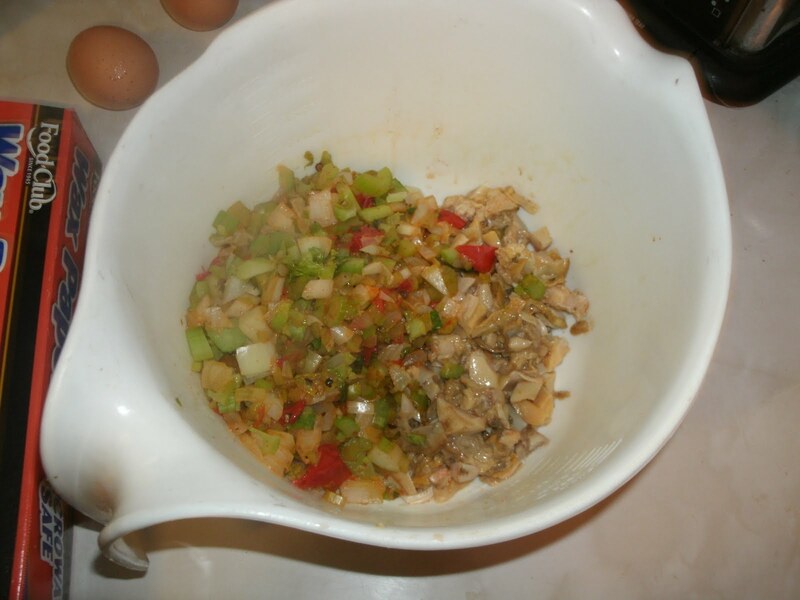 Chop up the clam meat and put it in a mixing bowl. 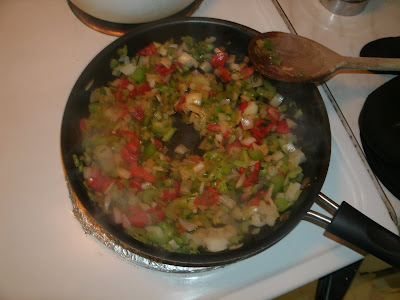 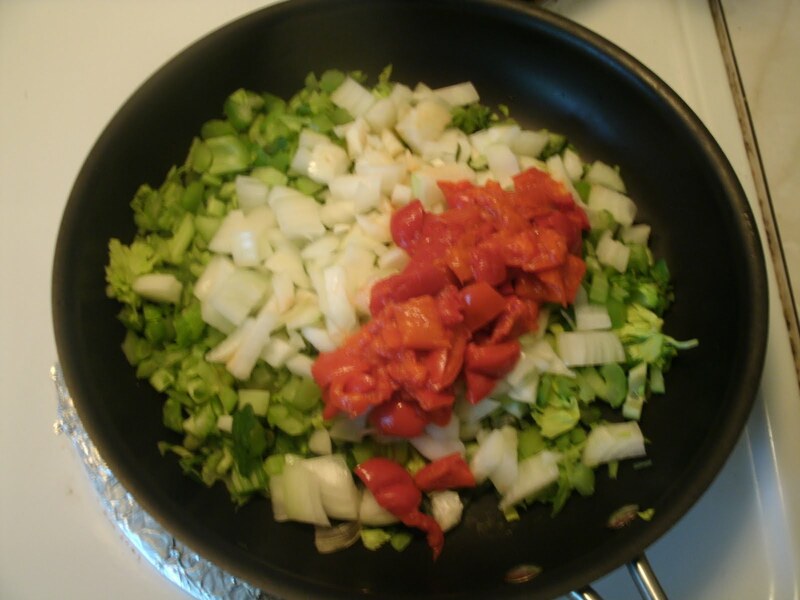 Saute the onion, pepper and celery. 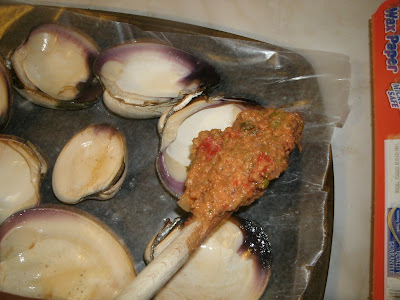 Toss the saute in the bowl with the clams and stir it up. 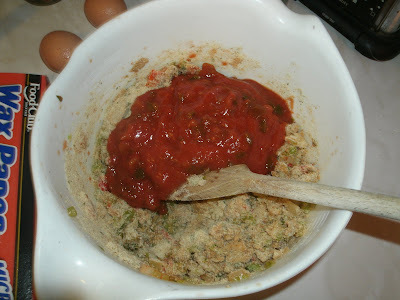 and empty the contents of the jar of salsa into the bowl. 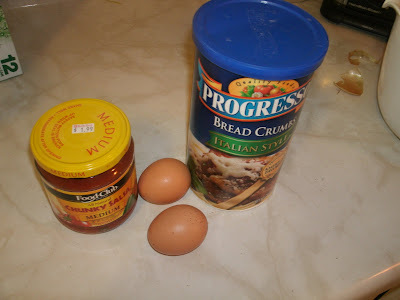 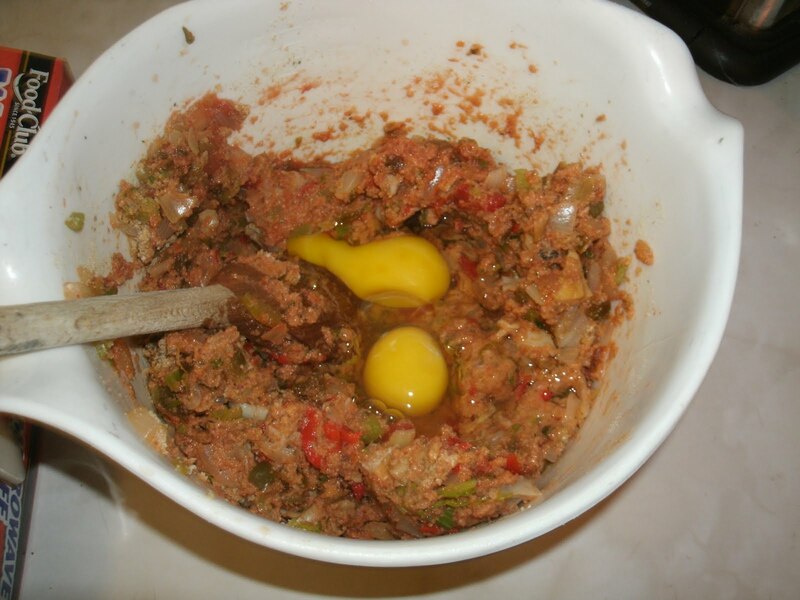 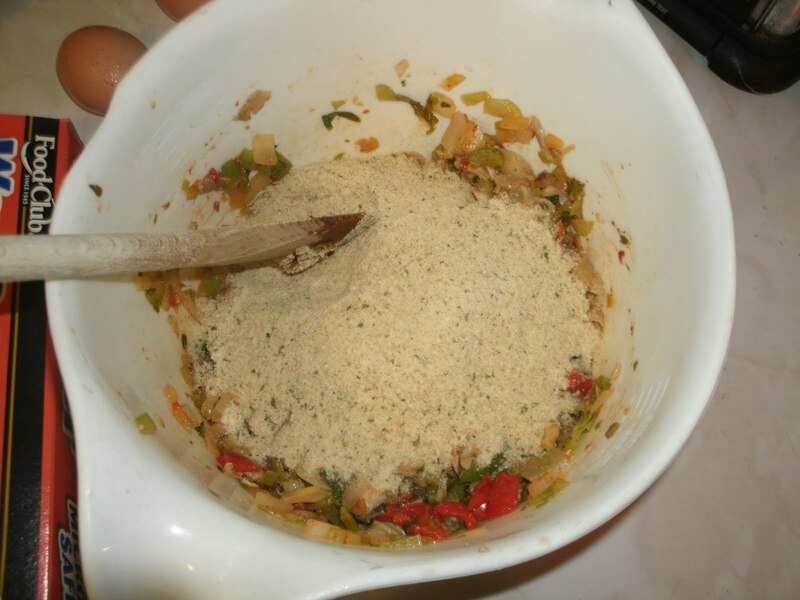 Add two eggs to bind it all together and mix everything together. I've put my shells on wax paper because I am going to freeze them. VOILA! These "stuffies" are ready to go. You can pop them in the oven at 350 degrees for 20-25 minutes or freeze them. 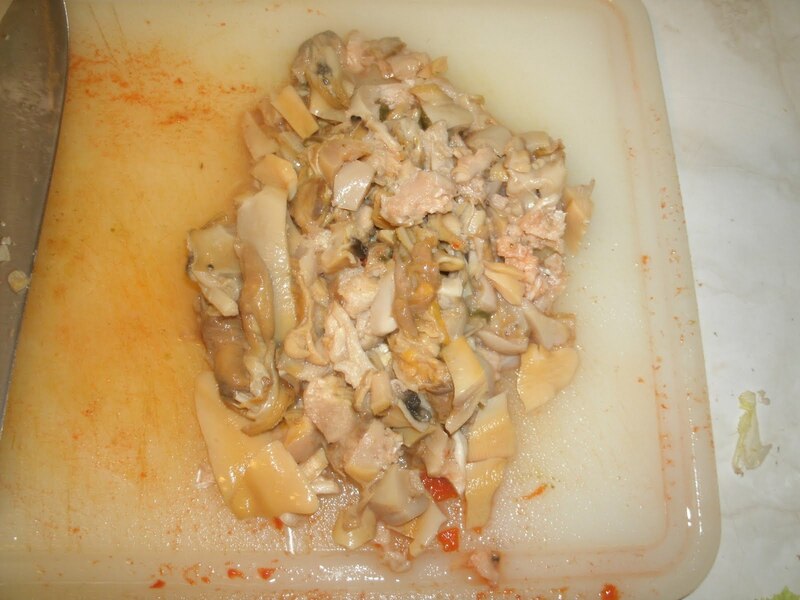 Here they are all frozen. 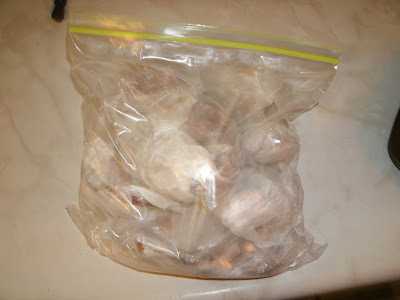 These frozen stuffed quahogs are bagged and ready for the freezer. They make a great appetizer or "football snack." 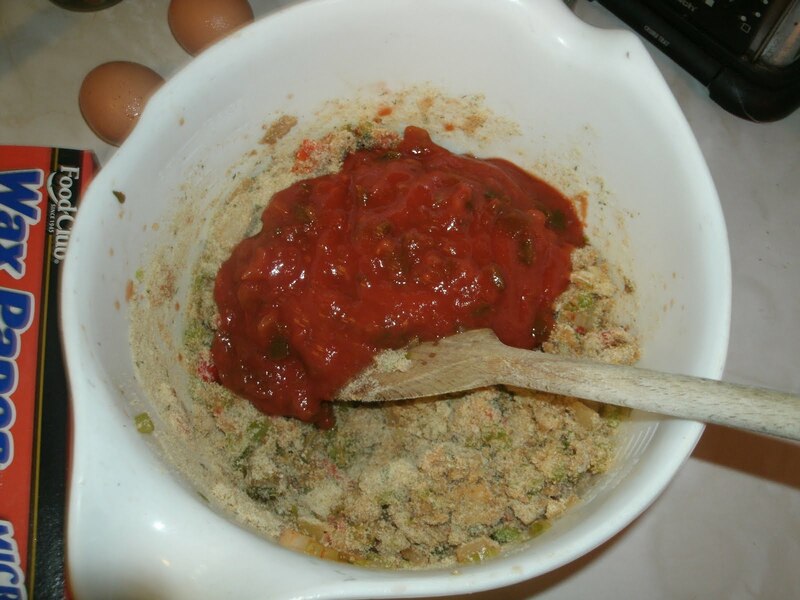 Just take out the frozen "stuffies" and bake for 20-25 minutes at 350 degrees. 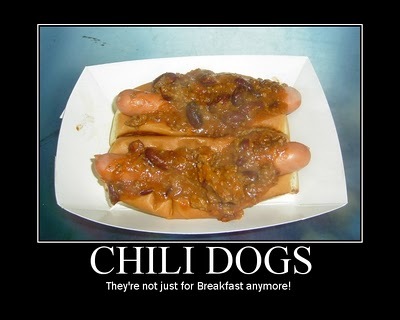 They are DELISH! 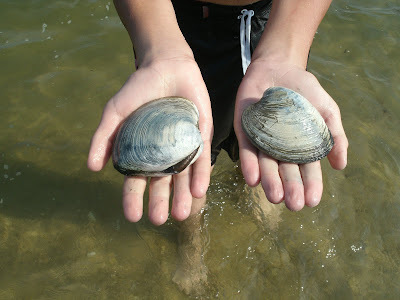 Wow, I had no idea quahogs were so big! 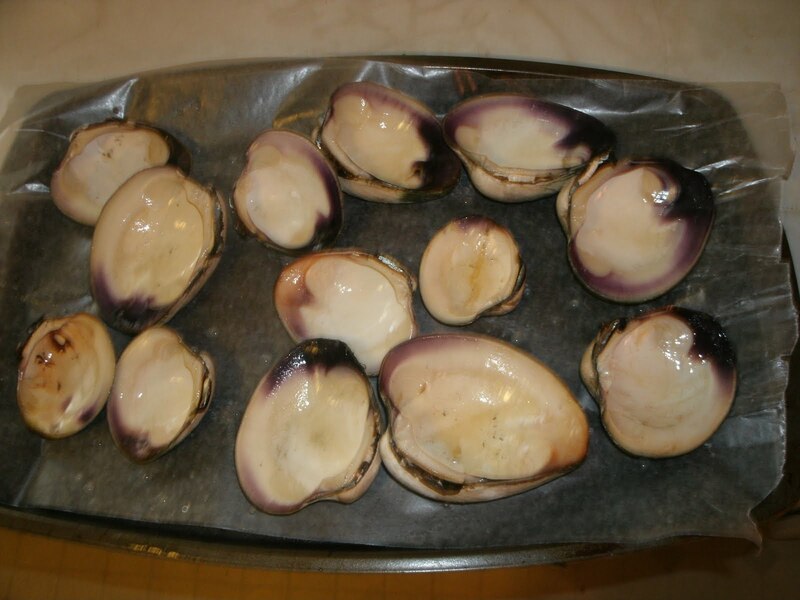 Totally bigger than the (steamed) clams I'm used to getting at a restaurant.